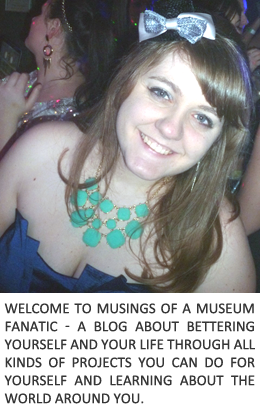 Musings of a Museum Fanatic: Get 'er done! Starting off this month I wasn't very happy with the number of 101 items I had crossed off. I was clocking in pretty low at like 12 but after further inspection I realized that I was able to cross off a few more. It was officially decided (by Stephanie and Kevin) that I was allowed to cross off meal planning and hold Gamma Phi office. Since I've been active president for a few months now we're counting it!! I was also able to fully cross off my birthday calendar and a herb planter. Word had a nice perpetual calendar so all I had to do was type in names! Printed it out and it's in a nice bright folder. I've also been using Google calendar a ton lately so I decided to add them all there too, maybe if I have it in multiple places I'll get way ahead of myself and send cards ... but that would require an up to date address book I'm guessing : ) My chives seem to be doing pretty well but the parsley has pretty much all turned brown and fallen out. The gardening experts have told me theirs isn't doing well this fall either so I don't feel so bad but I'm still skeptical. In addition I've started and am half way through a bunch of items. Have almost eaten all my new fruits and veggies, I think I'm at three of each. Definitely not a fan of kale! Got a little freaked out at my first library program ... was doing research for my haunted Chicago post : ) Joined up with a meet up group in the northwest burbs and they do a lot of trivia nights. The agenda for our video game day is all plotted, yup there is an agenda!! The biggest and most excited progress I've made on my 101 list is on #58. After weigh in on Wednesday I'm down 6.4 lbs (2.2 for the week)!!!! Congratulations! That is awesome! You're crossing off things like crazy! Congrats! That is exciting that you are getting them done!